Name Idea: In recognition of the contribution to Daramalan Sport by Brother David Merrick MSC. Colours: Black badge, red edge, white chevron, red and black figures and lion rampant. House Flag: Black to mast with lion rampant; red trailing. Flag is pennant shape. 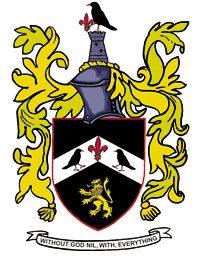 Crest: Black shield, yellow staves a flame, black Cornish choughs, red legs and beaks, red fleur delys, lion rampant, castle above head shield. This is the Blackman crest, Australia.